Ptolemy Samuel Henry Colmer was born in South Petherton in 1841, the son of herbalist Robert Slade Colmer and his wife Jane née Allen - who were later both to be found guilty of murder. Ptolemy's father Robert was a medical herbalist and in 1851 was living in Middle Street with his wife and five young children. In the 1861 census Ptolemy was listed as a boarder at 94 Dundas Street, Glasgow, where he was a medical student. On 24 February 1865 in the parish church of St Giles Cripplegate in London, Ptolemy married Susan Jacob the daughter of Baltonsborough farmer Robert Jacob. On his marriage certificate Ptolemy listed his profession as physician & surgeon and his residence as St Giles Cripplegate. Sadly Susan died in the winter of 1870 and the 1871 census shows Ptolemy listed as a 29-year-old physician & surgeon living in Princes Street, Yeovil with his son Ptolemy Augustus aged four, daughter Frances Gertrude aged two and son Albert Ernest aged one. In the summer of 1871 however, Ptolemy was to marry his dead wife's sister Frances Louisa Jacob. Ptolemy and Frances had two children, Ralph Henry James born in 1874, and Arnold Hugh born in 1878. Unfortunately Frances died shortly thereafter. On 15 April 1880 Ptolemy married for the third time at Wood Green, north London. Ptolemy was now aged 38 and a widower, his new wife was 22-year-old spinster Catherine Mary Offin of Wood Green, the daughter of William Offin a leather merchant. 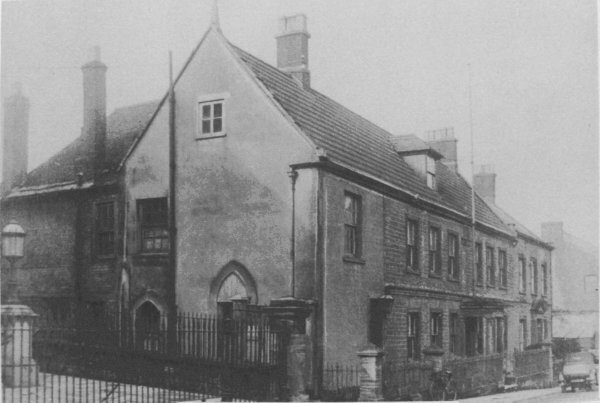 In the 1881 census Ptolemy, aged 39, and Catherine, aged 23, were living at South Street House, 79 South Street (the former home of glove manufacturer Richard Ewens) with six children, Ptolemy's sister Bernice and his assistant Robert Gilbert, together with a housemaid, a cook and a nurse. Ptolemy and Catherine were to have two children, Cecil born in 1881 and Vyvian born in 1882. 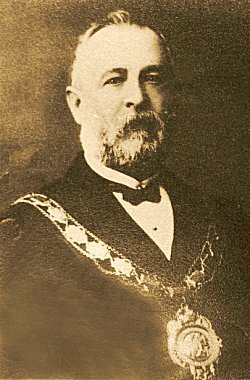 Ptolemy was a Freemason and was initiated into Yeovil's Lodge of Brotherly Love on 21 March 1888. 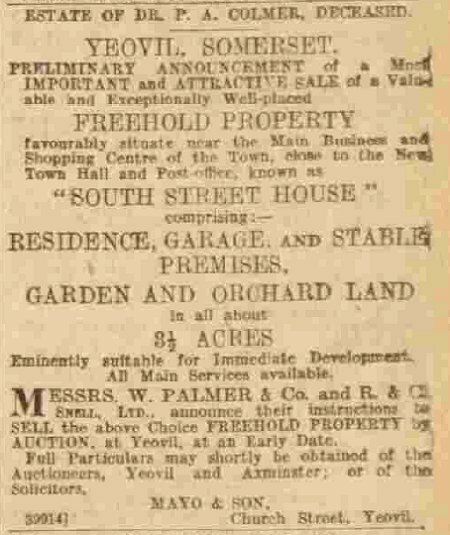 Ptolemy entered local politics and was elected mayor of Yeovil twice, serving from 1887 to 1889 and again from 1890 to 1892. He remained on the council as an alderman after his service as mayor. In 1892 he was appointed as a Borough Magistrate. 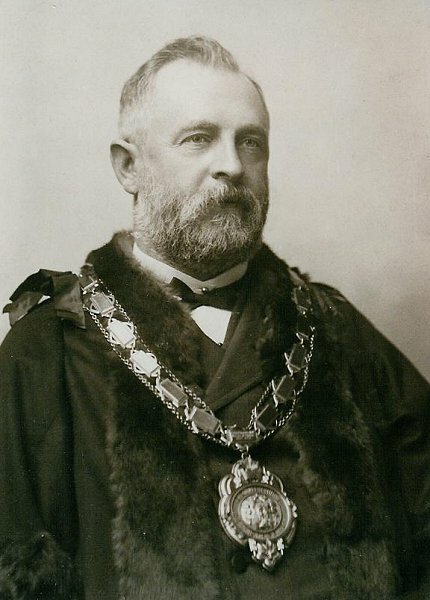 In 1892 he retired from public office and "at a great banquet to the council and prominent townsfolk, the doctor wore for the first time a striking addition to the civic regalia: the chain of office in silver gilt purchased by public subscription and now inscribed with the names and dates of office of the Mayors of the Borough." The 1891 census saw Ptolemy and his family still resident at 79 South Street where he and Catherine together with six of their children and a cook, housemaid and children's made were all living. At this time Ptolemy gave his occupation as 'Doctor of Medicine, Surgeon etc in general practice' and Ptolemy Jnr, by now aged 24, gave his occupation as 'Medical Practitioner, assistant to father'. Ptolemy Colmer died 8 April 1897 in Yeovil. His will was proven in Taunton on 19 July to his widow Catherine, son Ptolemy and John Michael Nicholls both physicians and surgeons. The total value of his effects were £1880 6s 3d (about £200,000 in 2017's value). His son Ptolemy Augustus took over the medical practice. "9 April 1897: Last night we were all much shocked and filled with sorrow by the sad news that our dear Dr Colmer had suddenly passed away, in a fit - for some time he had been ailing, but nothing serious was apprehended. Only two days previously he was in our house attending Mamma for erysipelas. We were deeply attached to him, and can scarcely realise that he is gone for ever - that we shall never behold him more upon this earth." "13 March 1897: Dear Dr Colmer was buried this afternoon - the funeral was very large and representative, Dr C having been widely connected and universally popular.